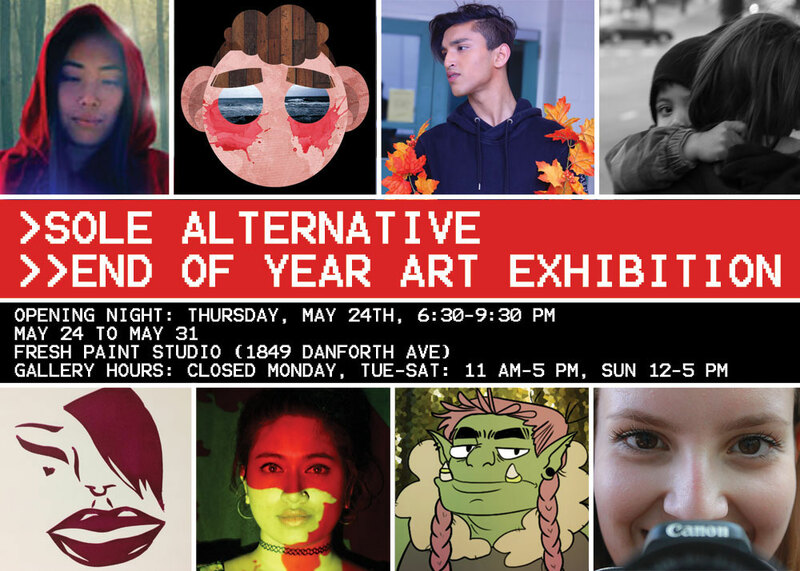 Young artists, photographers and graphic designers from SOLE Alternative are bringing an eclectic body of work to the community with the high school’s fourth annual Art Show, held at Fresh Paint Studio located at 1849 Danforth Ave. Opening night, featuring food, refreshments, and a live DJ, will be held on Thursday, May 24 from 6:30–9:30 p.m.
SOLE’s innovative art and technology program allows student artists to express themselves through a variety of media, from traditional drawing, painting, and sculpture to digital photography, photo manipulation, resin coating, silk-screening, and assemblages. The work, inspired by street photography, contemporary design, and modern and historical artists including Dawn Coleman Edmonson, Roy Lichtenstein, Shepard Fairey, Andy Warhol, and Luisa Uribe, explores themes such as identity, the urban environment, and the subconscious. The show promises to connect, provoke, and inspire, amplifying the diverse voices of youth and sharing their talents and creativity with the Toronto art scene. Time: Opening: May 24 from 6:30–9:30 p.m.
Gallery hours: Monday – Closed; Tuesday–Saturday from 11 a.m.-9 p.m.; Sunday – noon–5 p.m.